The premise for takedown counter drills is to stop your opponent’s initial attack and then create a counterattack in which you score. Bill Welker’s pancake takedown series is a neutral position maneuver that very few wrestling authors have given attention to over the years. The success of your scholastic wrestling program will depend largely on how well you prepare practice sessions from day to day. The typical wrestling workout session involves spending about 50 percent of the time in the neutral position perfecting takedown skills. This is a smart workout approach because of the great importance takedown superiority has for winning matches. Next, both bottom and top mat wrestling would be equally divided for the purpose of polishing escape or reversal and ride or pinning combination skills. 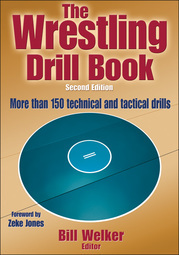 In The Wrestling Drill Book, Second Edition, nine of the sport’s top coaches offer more than 160 drills for mastering essential techniques: takedowns, reversals, escapes, riding, and pinning combinations. Detailed descriptions, coaching points, corrections to common errors, and 400 photos provide thorough instruction for proper execution of each move.